The Washington Land Project in North West Greenland contains the Cass Fjord base and precious metals prospect which was discovered in 1999 during helicopter reconnaissance. Zinc, lead and barium mineralisation was found at surface along a lineament. A single diamond hole was drilled vertically into one of the mineralised areas shortly after discovery and returned 1.2m @ 8.4% Zn and 98 g/t Ag from 2m depth. No follow up work was performed until Ironbark drilled the prospect in August 2011. Eleven widely spaced holes over a 2.7km strike length were drilled and all were mineralised with intercepts at depth. In 2011, Ironbark announced the assay results from its drilling programme at Washington Land. 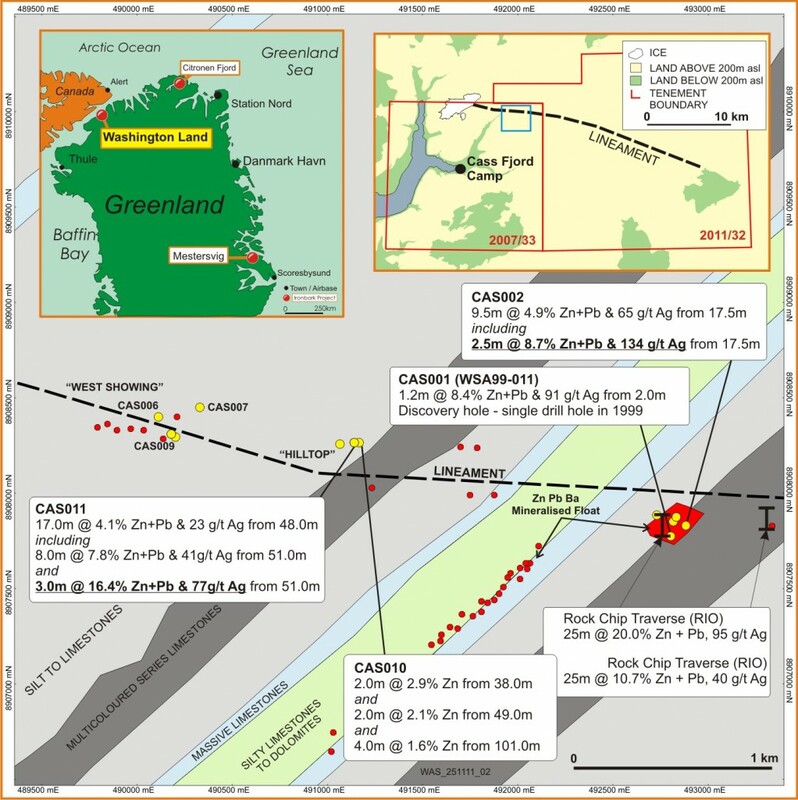 Significant widths of high-grade, primary zinc-lead-silver-barite mineralisation were drilled around and along strike from the single discovery drill hole completed by Rio Tinto PLC (“Rio Tinto”) in 1999 at the Cass Fjord Prospect. All holes drilled over a 2.7km strike were mineralised with follow up drilling planned for 2012. The results validate the Washington Land project as having the potential to host a large scale base metal resource. This prospect was identified during brief helicopter reconnaissance in 1999 by Rio Tinto and only one drill hole was completed before pre-planned demobilisation of the regional exploration programme 80km away. No follow-up work occurred until Ironbark’s drilling programme in 2011.